Clara Lieu is a visual artist and an adjunct professor at the Rhode Island School of Design. 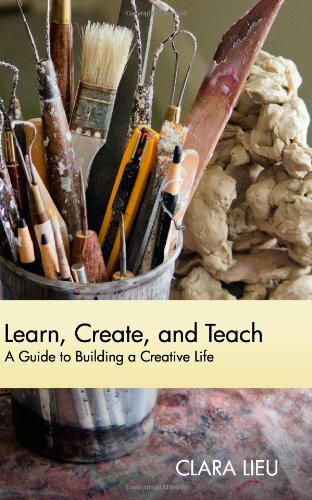 Learn, Create, and Teach reads like a self-help book for artists. There are three main chapters written for the student, professional and teacher. Whether you are one of them or not is not that important because you'll still gain from knowing how others think. The lessons and advice in the book are from the life experiences of Clara, both as a student and a teaching professional.There are tips on challenging yourself, managing time, teaching, learning and working. Clara has put in many of her stories to emphasize the point she wants to make. You'll probably be able to relate to many of the lessons. It's written in a concise and candid manner. You can probably finish reading the book in a day. The last portion of the book deals with frequently asked questions and Clara's answers to them. Of course with any self-help book, it requires you to put in the effort. It's a motivating book, a good one to have by the side to read again at times just to absorb the tips at a sub-conscious level. You can read an excerpt of the book on her website. This book is also available as a Kindle edition which I'll recommend over the physical copy if you have the Kindle. Be sure to check out her blog as there are many insightful articles there as well.